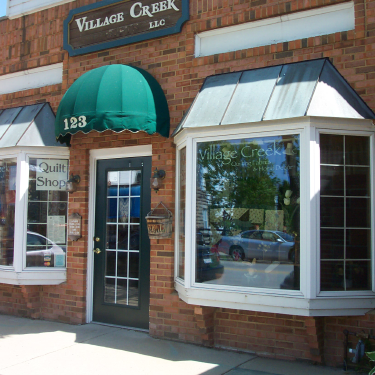 Village Creek is located in the center of historic downtown Lodi, Wisconsin — just 20 minutes north of Madison and right off Wisconsin Scenic Byway 60, the Lower Wisconsin River Road. Whether you are looking for quilting fabrics, supplies, or just need to get inspired — we are the shop for you. Our shop will delight both the browser and the serious quilter. Our friendly and knowledgeable staff will be there to help answer any of your quilting questions. Stop in and get inspired!